Mana is the foundation of Magic. Although it is possible to design and build decks without mana production, it is extremely difficult. More importantly, the possibilities for mana production define the range of strategic possibilities in Magic. This is why Zvi Mowshowitz once claimed that he began analyzing a format by examining the possibilities inherent in that format’s mana production capacity. Lands are the building blocks of mana production. While there are many forms of mana production, and while it is possible to build decks without mana producing lands (or even lands at all), mana producing lands are the most basic building block in the game of Magic. They shape and constrain the strategic possibilities in the game. We do not know what dual lands will be in Theros or what they look like, but with Theros scheduled for release on September 27, the entire set will be spoiled within weeks. The mystery of what Theros may hold is an opportunity to speculate as to how the current design staff might approach dual land design. In doing so, it is also a good opportunity to look back and examine more carefully how dual lands have been designed in the past, what differences and general approaches exist to designing dual lands, and what design space remains untapped for dual lands. I will close by identifying potential approaches that might be used in Theros or beyond. The creators of the game of Magic made a critical and profoundly long-term decision when they included the original dual lands in Alpha. Alpha only had 15 lands in the entire set, and each land was a mana producer: 5 basic lands and 10 dual lands, one for each combination of colors. The designers of the game sought strategic diversity. One way of fostering this diversity was encouraging players to play multi-color decks. To that end, they included powerful color hosers in the game in order to compel players to diversify their strategies both tactically and by color. They also promoted strategic diversity by including these dual lands. These dual lands more easily allowed players to build multi-color decks. Their presence defined the strategic diversity in the game for many years, and continues to do so in formats like Vintage and Legacy. Bo Bell’s Championship-winning decklist would not have been possible without Alpha dual lands. His spell configuration relied upon consistent access to secondary and tertiary colors. Bo Bell’s decklist, constructed almost entirely on dual lands, would define constructed Magic for many years. 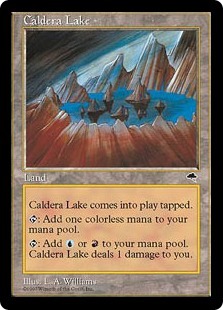 The Alpha/Beta/Unlimited/Revised dual lands were so powerful because they counted as two of any basic land, and there was absolutely no drawback to including them, aside from vulnerability to land specific hosers, like Tsunami or Flashfires. Cards like Blood Moon, Wasteland, and Back to Basics were a long way away from being printed, so that there was no real disadvantage to playing a dual land over a basic land. In a sense, they were superior to basic lands. They were just more difficult to acquire (being that they were printed at rare, rather than common). 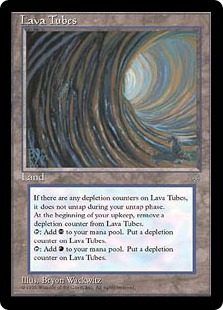 Depletion lands act like the Alpha dual lands with one big caveat: they can only be used every other turn! This drawback was so severe that these lands quickly fell out of favor and into disuse. The developers of Magic at Wizards seemed to recognize this fatal design flaw, and lands like this were seldom seen from again moving forward. On the other hand, pain lands were not only instant hits, but enjoyed long use for years to come. Pain lands could produce one mana of any two colors for one life. City of Brass established the idea that lands could be created that produced multiple colors of mana in exchange for loss of life. What made pain lands better than City of Brass in some decks is that they could be used without losing life. Drawing colored mana would cause a loss of life, but they could be tapped for colorless without any life loss at all. With Ice Age, the designers of Magic marked a course to develop new dual lands. They were successful in one instance, and unsuccessful in another. Released in October 1997, Tempest was a very popular set with creative and aggressive new card design. With Tempest, Wizards of the Coast attempted to introduce a few tweaks to the dual land concept with two new dual land cycles; one rare and one uncommon. First, they created close functional reprints of Ice Age’s “pain lands” in enemy colors, but they the added drawback that they come into play tapped. 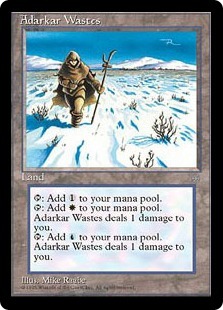 Second, they brought back “depletion lands” with a sleeker design commonly called “slow lands” or “stuck lands.” These lands were functionally identical to Ice Age’s “depletion lands,” except instead of adding a depletion counter, which would prevent usage, “slow lands” simply do not untap for a turn after being used. Both of these cycles of dual lands were weak in comparison to those that came before and after. Invasion, released in October 2000, was the next notable attempt to design new dual lands. Invasion was one of most carefully developed and playtested set in Magic to this point, and was the first set worked on by Magic legend Randy Buehler. Invasion’s dual lands, known as “tap lands,” can be played exactly like Alpha’s dual lands except that they do not count as basic land types, and more importantly, they come into play tapped. These dual lands saw play in constructed formats like Block Constructed. Invasion’s dual lands are far more playable than depletion land or slow lands, but the tempo cost of being unable to use them immediately meant that the Ice Age pain lands, reprinted now many times in the core set, were preferred for formats like Standard. This has proven so successful that it has been repeated over and over again in Coldsnap, Zendikar, Return to Ravnica, and Gatecrash. As a footnote, this approach was expanded to three color lands (tri-lands) with Shards of Alara, disproving the concern that tap lands were overpowered. The final expansion of Invasion block, Apocalypse was released with great fanfare in June of 2001. With it came the long awaited release of the “enemy” pain lands. Ice Age had originally delivered pain lands only in allied colors, as the designers of Magic have traditionally released allied strategies first chronologically. The entire Invasion block was a multi-colored themed block, and Apocalypse specifically was themed with gold and multi-colored cards like Spiritmonger and Vindicate that contained “enemy” mana costs (black and green together, for example). To support this Wizards finally released the cycle of “enemy” pain lands in Apocalypse, completing the cycle that Ice Age had started 6 years before it, and was wildly popular with players. 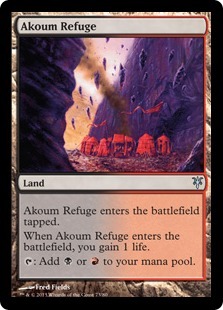 The cycle of five rare dual lands had one land for each allied color combination. Each land, with one additional mana source, would produce two different colors of mana. The advantage of this design approach is that both colors of mana could be produced without the drawback of either having to come into play tapped, not untapping as usual, or requiring life to use. 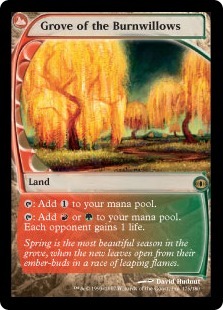 In that respect, this is the first dual land since Revised to not have one of those drawbacks. These lands offered strategic and color diversity, but were limited in two critical respects. First, they required another source of mana to generate any mana at all. In that respect and as a practical matter, they could not be used on turn one in most formats. Second, they were imprecise. 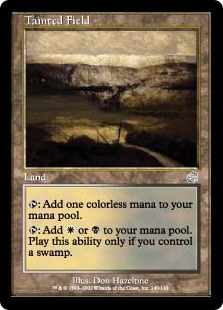 Every previous dual land had the potential to generate two colors of mana, but only one mana for each usage. By generating two mana on every usage, the mana generated by filter lands were sometimes more than or different than desired or necessary. This problem would be addressed in future variants on this idea. Torment was released in January 2002, as the expansion set to Odyssey. 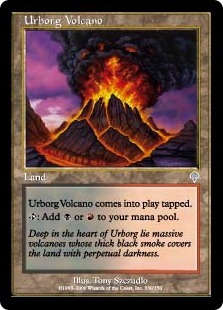 With a heavy focus on black, Torment introduced a cycle of four uncommon dual lands that were equally unique to the dual land concept introduced in Odyssey. Known as “Tainted” lands, for the ways in which they were affected by ‘black magic,’ each land was in fact a conditional dual land. By themselves, they could only be used to generate colorless mana. However, if their controlled also controlled a Swamp, they could be used just like Alpha dual lands. Tainted lands were an important design innovation because they were the first truly ‘conditional’ dual lands. 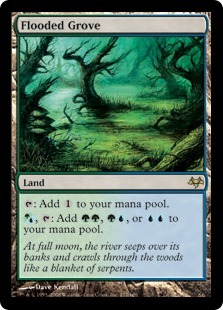 While filter lands required an outside mana source to activate, these lands could not be used at all to generate colored mana without a Swamp in play. These dual lands opened up design space by suggesting that mana producing dual lands could be conditioned in various ways besides simply requiring an additional mana source. The reliability of the conditional requirement defined their playability, but the fact that they could be used for colorless regardless of the condition made them immediately useful in ways that tap lands were not. Ravnica: City of Guilds was released in September 2005, and brought with it the most innovative and popular dual lands since Revised. Ravnica introduced two new dual land concepts which integrated and elaborated on previous approaches, yet also transcended them. Probably the best dual land since Alpha, Ravnica’s “shock lands” function identically to Alpha’s dual lands, except that they come into play tapped unless their controller pays 2 life (“shocking” them for 2, hence the nickname). In the early game, when mana is scarce, this was a price well worth paying. And in the late game, when mana is superfluous, it need not be paid. It is interesting how the two main drawbacks on dual land variants: losing life or coming into play tapped, are integrated into one simple mechanic. Ravnica’s shock lands would prove to be the second best dual lands ever printed and are the foundation for the Modern format’s mana base. Ravnica also introduced another interesting cycle of dual lands. 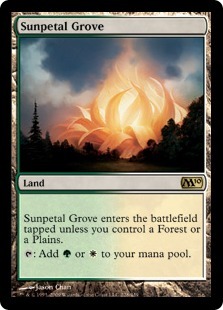 If players were willing to use Odyssey’s filter lands to get multiple colors of mana, would they be willing to get two colors of mana, permanently, by bouncing another land? This what Ravnica’s “bounce” or “karoo” lands do. Like filter lands, bounce lands produce both colors of mana simultaneously. And like filter lands, if these are your only mana source you will be in trouble. However, unlike filter lands, they are conditional in the unfortunate sense that they come into play tapped. Even worse, instead requiring another mana source, they require that you return another land to hand. That land could be an advantage if it can be used for some other purpose (since you have + 1 card in hand). But the practical effect of these limitations is that these bounce lands can’t be used until turn three. That’s because they can’t be played on turn one, and they won’t untap until turn three. Introducing key words such as “snow” into the card super-type provides an interesting and under-explored way to modify card design. Many conditionalities of other powerful cards could be tied to these super-types, increasing the incentive to play a specific land super-type more often. Future Sight, released in May 2007, introduced five totally distinct dual lands, each with its design implications, and each with its own innovative potential. Grove of the Burnwillows inverts the traditional “pain land” model, by giving life to the opponent instead. In general, that is probably weaker than pain lands, but became a very potent combo with Punishing Fire. Graven Cairns was a “future shifted” card that would later be printed in a full cycle of new dual lands in Shadowmoor. I will say more about this design below. Nimbus Maze slightly expanded on Torment’s “Tainted” lands conditionality, by building a different conditionality into each color production. 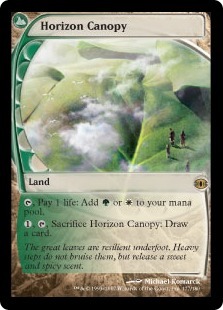 Horizon Canopy is a simple pain land design, except that it trades off the ability to tap for colorless with a very desirable secondary activated ability. This design space, of pasting on additional benefits, has little been developed, but remains an area ripe for exploration. 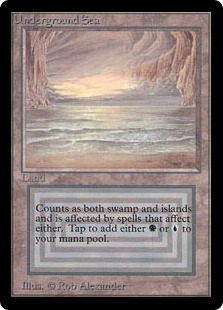 River of Tears is the arguably the most unique dual land ever printed. It is a dual land in the sense that it can produce either blue or black mana, but requires that you do something else in order to generate a black mana – namely, play a land this turn. This is a very unique from of conditionality that could be expanded in other ways, such as playing creatures, or other spell types. 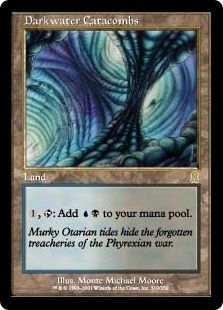 Lorwyn, released in the Fall of 2007, was the first set to introduce new ‘conditional lands,’ five years after Torment first suggested this possibility. Lorwyn featured a cycle of five rare dual lands. These lands integrated a conditional element first suggested by Torment with the “comes into play tapped” drawback printed in Invasion. These lands come into play tapped unless you reveal a create of a creature of a particular tribe from your hand. 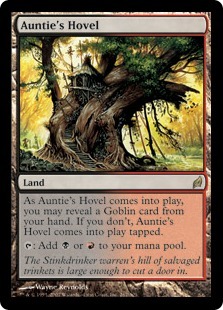 For a tribal deck, like Merfolk or Goblins, you are almost guaranteed to be able to use this land immediately. At worst, these lands function like Invasion’s dual lands, which makes them pretty much strictly superior to regular tap lands. At best, they function almost identically to Alpha dual lands. That made these dual lands useful, but most useful for narrow strategies and less so for deck construction outside of tribal strategies. Shadowmoor and Eventide were released in the spring and summer of 2008. Each set contained a cycle of five new filter lands (one set had the allied color cycle and the other set the enemy color cycle), known as “hybrid filter lands.” These dual lands could be tapped for colorless or they could produce two of a single color or both colors when an allied color has been used to activate it. Whereas Odyssey’s filter lands turned one colorless and the land itself into two colors of mana, Shadowmoor and Eventide printed more flexible versions, alleviating part of the imprecision drawback described above. Although they require an allied mana source to activate the second mana ability, it is a more flexible activation since each dual land can produce one of three possible mana combinations. In addition, these lands could be tapped for colorless, which means that they could be played on turn 1. For two color decks, these lands are probably strictly superior to Odyssey’s filter lands. For three or more color decks, Odyssey’s filter lands may be more advantageous, despite the fact that these lands can be tapped for a colorless. Yet again, Wizards has demonstrated a willingness to elaborate upon and design creative dual land templates. Released in the summer of 2009, Magic 2010 brought many brilliant ideas into the game of Magic, and reinvigorated Magic’s design and rules. 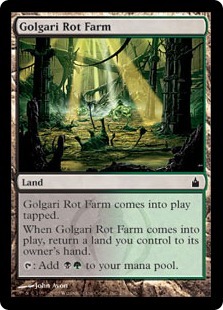 One of the innovations in M10 was expanding on the idea first introduced in Torment of conditional tap lands. These so-called “buddy lands” would come into play tapped unless you controlled a basic land allied with the dual land. 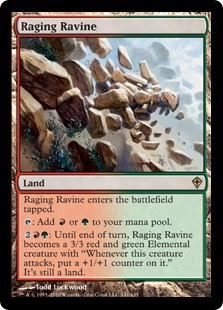 These lands were more useful for generating colored mana than Torment’s “Tainted” lands because there were more circumstance that could satisfy these conditions. However, unlike Torment’s dual lands they could not be used on turn one since they don’t tap for a colorless. Released in the fall of 2009, Zendikar introduced a cycle of five uncommon dual lands that were almost identical to the tap lands first introduced in Invasion with one big difference: they gained their controller a life when they came into play. That made them strictly, although very marginally, superior to them. This cycle suggests how very marginal changes could mitigate drawbacks or affect consideration for play. Even though these were better than existing tap lands, they saw relatively little tournament play due to the availability of other stronger options in the respective formats, most often with fewer drawbacks or more raw power. This seemed to signal from the player base to designers that the generic “tap lands” with the comes-into-play-tapped drawback would have to include something else very generous to make it constructed format deck-worthy. Worldwake introduced a new cycle of dual lands that is less important for innovating creative approaches to mana production than to exploring what is possible with dual lands more generally. 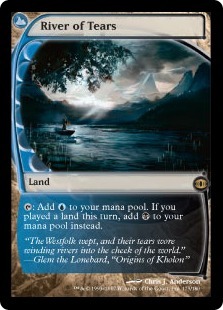 Specifically, Worldwake’s cycle of five dual lands are each also “man-lands.” Like Invasion’s tap lands, each land comes into play tapped. 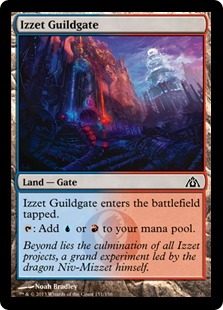 However, like Mishra’s Factory from Antiquities, each land can be activated to become a creature, whose characteristics reflect the themes of the color wheel. 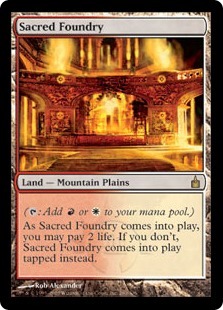 These lands not only helped fix mana development and your mana base, but they also provided win conditions, making them an important new printing for constructed and limited formats alike. 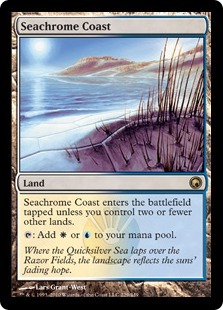 Released in the fall of 2010, Scars of Mirrodin introduced a conditional twist on tap lands. These dual lands come into play untapped unless you already have two or more lands in play, in which case they come into play tapped. They inhibit your mid and late-game development, but only if they are the third or later land you play. In contrast, they do not inhibit your early game development. Deck designers would need to recognize the balance in mana availability with the curve of mana development on specific turns. These lands suggest different ways to condition the “comes into play tapped” instruction. Perhaps recognizing the waning popularity of the generic taps lands, the developers at Wizards seemed to be slightly improving the quality of the tap land variants, and these lands saw a great deal of play in Standard when legal, and now see play in the Modern format as well, validating the developer’s marginal improvements on card design. 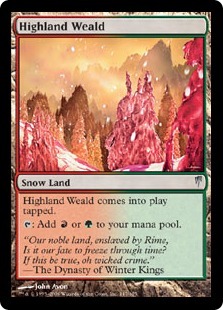 Much as Coldsnap reprinted Invasion’s tap lands but added the “snow” card super-type, Return to Ravnica and Gaterash reprinted functionally identical tap lands that incorporated the “gate” card type. As mentioned before, incorporating new keyword land super-types into card design opens up new avenues for other cards to interact with. The designers of the Return to Ravnica block have finally begun to push that forward a little bit with the introduction of cards like Gatecreeper Vine (a creature which allows you to search out a ‘Gate’ when entering play), Hold the Gates (an enchantment that gives creatures you control +0/+1 for every ‘Gate’ you control), Opal Lake Gatekeepers (a creature which draws a card when entering play if you control 2 or more ‘Gates’), and others. Despite 20 years of printings, there remains open a vast array of possibilities for designing new dual lands. This brief review suggests to me that Wizards has just scratched the surface of what is possible for new dual lands. This is not hyperbole. Consider just one variable: conditionality. The possibilities for making dual lands come into play tapped or untapped based upon conditions such as cards in hand or cards in play is virtually infinite. And that is just one variable. When you consider other variables, the possibilities are truly infinite. You could build in benefits like life loss or life gain in infinite variations to modify the value or playability of a card. Not to mention the possibly for additional advantages based upon additional card types, just as Snow Lands or Gates provided in Coldsnap and Return to Ravnica/Gatecrash. The dual lands in Future Sight alone tantalizingly suggest the tremendous scope of possibilities (see discussion of River of Tears above). • M10 tap lands that can alternatively tap for a colorless regardless of any other lands in play. • Odyssey filter lands that can alternatively tap for a colorless. • Even Ravnica’s bounce/karoo lands that don’t come into play tapped would seem printable to me (although we could debate that). When ~this~ comes into play, choose blue or white. Such lands would be inferior to the Alpha dual lands, but situationally better than many of the dual lands that have seen print. In a design article I published a few months ago, I identified three particularly fruitful areas of design for Eternal formats: 1) designing cards that are situationally better and worse than existing playables, 2) designing unique or extreme conditionality, and 3) designing unusual alternative costs. While all three principles are applicable to the design of dual lands, the first is particularly suggestive. In the 20 years of attempts to design playable, but not overpowered, dual lands, there exist a wide range of possibilities we have just surveyed. Simply mixing and matching elements alone opens wide vistas of design possibilities that have yet to be fully explored. We looked at life loss, coming into play tapped, returning lands to hand, conditionality (cards in play, cards in hand, etc. ), card super-types, and much more – all of which can mixed and matched in virtually infinite combinations. Speaking of card types, the most exciting possibility that I can envision for Theros that is thematically resonant with the emphasis on Legends in Theros is the possibility that the original dual lands, or something similar to them, could be printed as Legendary permanents. Being Legendary, they would be inferior to the original Alpha dual lands. It would be difficult to justify playing more than one or two per deck in Eternal formats, but would marginally help mana bases in all formats. Yet, by not coming into play tapped or consuming life, they would be better than most of the dual lands already in print. Because you could not build a mana base entirely around them alone, they would most likely complement or supplement other mana production possibilities. I doubt such a design would be overpowered, especially if they did not count as basic land types and could not be fetched out with Onslaught and Zendikar fetchlands. Whatever the ultimate design approach proves to be in Theros, the possibilities for dual land design are tremendous and relatively under-explored. I look forward to seeing what emerges in coming years. I hope you enjoyed this brief trip into the history of a this important card type.